Welcome to my online business page! Here, you’ll find all my favorite online business resouces for making money online. I get asked soooo much about making money online, so I created a course for bloggers with everything I know about making money online. It’s called Blog With A Full Time Job. If you want my best blogging advice, that’s where you’ll get it! 5 Day Online Business Bootcamp - this is my free course where I help you decide whether to start a blog and teach you how to do it (plus next steps to turn it into a business). How I Made $45K Blogging In 1 Year While Working Full Time Free eBook - this is a look into how I made $45k blogging in 1 year while working full time. It's a portion of the eBook that I offer in my store. Blog With A Full Time Job 12 Month Blog Plan - this is the exact 12 month plan I recommend for starting, growing, and launching your blog when you work full time. The Beginner's Guide To Branding Your Blog - this is an amazing download that shows you how to create a brand for your online business so you attract the right customers. The Essential Blog Post Promotion Checklist - this download will show you exactly how and where to promote your blog post once you've written it. It's fantastic! 7 Surefire Ways To Boost Your Blog Income Overnight - this download has really applicable tips for taking your blog income up a notch asap. I highly recommend it if you already have a blog. 120 Awesome Blog Post Ideas - this is a freebie that gives you soooo many blog post ideas! If you just launched a blog or are thinking about starting a blog, definitely grab this one. It will come in handy when you're not sure what to write! The New Blogger's Guide To Guest Posting - this is a download that shows you how to get started guest posting on other blogs. I highly recommend this if you're a blogger. Guest posting is an important part of growing your blog. Blog Structure Blueprint - this is a template that gives you a visual for how to organize your blog. I used this when I started and it taught me exactly how I should format my blog for the reader. 10 Steps To Take When A Post Goes Viral - this is a download that gives you specific tips for what to do when a blog post goes viral. If you already have a blog and you publish content on it, grab this - you never know when your blog is going to go viral, and you don't want to miss an opportunity! The Best Free WordPress Plugins - this download is a list of the very best WordPress plugins that you should use in your online business. 15 Mobile Apps Every Blogger Needs For On The Go - this download is perfect if you want to be able to blog better on your phone. Highly recommend it! Start A Website With Bluehost – my special link, just for my readers, where you can start a blog for $2.95! How to Start a Blog Tutorial – my step by step blog post on how to start a blog. How To Start A Profitable Blog While Working Full Time – a complete guide to becoming a blogger when you have a full time job. 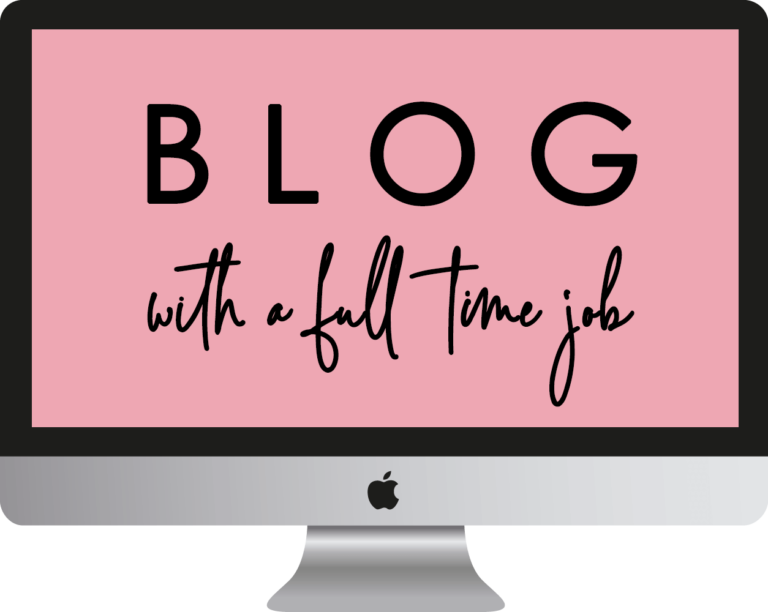 How To Become A Full Time Blogger – an overview of everything you need to do to turn a blog into a full time job. Time Management Tips For Bloggers (How I Made Money Blogging and Worked Full Time) – a look at how to manage your time as a blogger, with three specific schedules based on what level blogger you are. Divi Theme – super popular website theme that you can use to create a theme identical to NatalieBacon.com. Why You Should Start A Blog – blog post about why the world needs your blog. 9 Tips For New Bloggers – my best tips for newbies. How to Become A Successful Blogger – my step by step guide for becoming a successful blogger. The 15 Best Podcasts For Blogging And Making Money Online – a blog post with the best podcasts for growing your blog. 8 Steps To Increase Your Blog Traffic – a blog post about increasing traffic. 5 Books Every Blogger Needs to Read – my fav blogging books. 10 Dos & Don’ts For Growing Your Blog – blog post about what to avoid doing on your blog. 10 Ways To Improve Your Blog Right Now – my best tips in a blog post. 100 Blog Post Ideas – a blog post with 100 blog post ideas. 21 SEO Tips To Increase Blog Traffic Right Now – how to increase your traffic with Google SEO. Secrets From A Photographer (6 Photography Tips For Bloggers) – how to take better blog photos. The Best Resources for Bloggers – all of my favorite blog things on one page for growing your blog. ? ConvertKit vs Mailchimp vs Aweber vs Drip – Email Marketing For Bloggers – a blog post comparing all four of these services. The Most Important Blog Metric To Make Money Blogging – a blog post about all things email marketing that you reallllly need to know. How I Grew My Email List to 10,000 Subscribers in 7 Months – a blog post about building your list from the ground up. ConvertKit (FREE 30 day trial with my link)- the email marketing software I use for capturing email addresses (it’s the bomb dot com). Lead Pages – the software I use for my lead magnet landing pages. 7 Steps to Get Started With Pinterest for Bloggers – a blog post about using Pinterest for your blog. How to Grow Your Instagram Following in 7 Steps – my fav steps for growing your insta account. Planoly – this is a total game changer for Instagram. I use it and am obsessed. How I Made $5k In 5 Days Blogging – a blog post where I share how I made $5k in 5 days on my blog. How I Made $14k Blogging In 1 Month – a YouTube video where I share my income report. How I Made $20k Blogging In July 2018 – a blog post where I share a rare income report. How To Make Money Blogging – a blog post about all the different ways to make money blogging. How to Make Money Blogging With Affiliate Marketing – a blogging course specifically about affiliate marketing (for beginner and intermediate bloggers). 8 Bloggers Who Make 5 & 6 Figures Every Month From Blogging – a blog post about bloggers who make a sh*t ton of money blogging. How To Turn Your Blog Into A Successful Business – a blog post about how to turn your blog into a real biz. Six Figure Blogger Review – a blog post with a complete review of the Six Figure Blogger course. The Only 2 Reasons Why Your Blog Isn’t Making Money (And What To Do About It) – a blog post about why you’re not making money blogging. Six Figure Blogger – this course changed my freaking life – it’s the shiiiznnit. Making Sense of Affiliate Marketing – this is a great course for getting started with affiliate marketing on your blog. How to Make Money as a Virtual Assistant - a course to learn how to become a Virtual assistant. How We Make Thousands Every Month Freelance Writing - a blog post about how three freelancers are crushing it. How To Become A Freelance Writer And Make Money Doing It - a blog post about how to become a freelance writer. How To Make Money As A Virtual Assistant - a blog post about how to make money as a VA. Earn More Writing - an awesome course for learning how to freelance write and make money doing it. Your Way To VA - a fantastic course for learning how to become a virtual assistant. BlueHost - the hosting company I recommend for new bloggers (I've used this one a lot and it's super cheap). Divi Theme - the theme I recommend for creating a blog design (you can create a design just like mine with it). ConvertKit (FREE 30 day trial with my link!) - the email platform I use and highly recommend (I'm obsessed!). ClickFunnels - the service I use to build sales pages and funnels for eBooks (it's freaking amazing). Teachable - the platform I use to host my coaching programs and courses (this is the standard). Tech Help for Your Blog - the company I use for technical issues on my blog (Grayson is legit - he's the best for all things WordPress). Lead Pages - the service I use for all my landing pages for my freebies (so simple and easy to use - I love it). Opt-In Monster - the service I use for capturing leads with a pop-up (makes everything look so much prettier). Blog With A Full Time Job - the foundation for learning how to start a website and monetize it while working full time (for brand new and beginner bloggers). Understanding CSS - a course for learning CSS code (I seriously wish this existed when I first started!). Six Figure Blogger - a course for learning how to increase your onlines business income up to six figures with advanced strategies (I'm obsessed with this course). Making Sense Of Affiliate Marketing - a course for learning the basics of affiliate marketing. Pinterest Traffic Avalanche - a course for learning how to drive traffic to your website from Pinterest (I love this course). Flourish With FB Ads - a Facebook course for learning how to use Facebook Ads on your site to grow and monetize it (use code Natalie50 to take $50 off). Earn More Writing - a course to that teaches you how to make money freelance writing. Your Way To VA - a course that teaches you how to become a virtual assistant. If you want to read my story of how I made $45k blogging while working full time, you might want to check out the book here: How I Made $45k Blogging In 1 Year While Working Full Time. Cheers to launching, growing, and monetizing your online business!